Departing minister Rev. Colin Bossen stands at UUSC's entrance ready to greet members of the congregation. Rev. 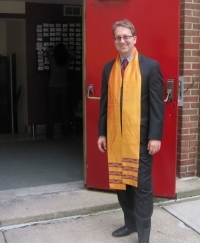 Colin Bossen, minister of the Unitarian Universalist Society of Cleveland (UUSC) since September 2007, officially stepped down on Aug. 12. He will move with his family to Boston to begin a doctoral program at Harvard University. Rev. Doug Wadkins, minister of the Unitarian Universalist congregation in Bellingham, Wash. for the past 13 years, will be interim minister at UUSC while the society searches for a new full-time minister. Bossen will enter Harvard University's Graduate School of Arts and Sciences, with the Committee on the History of American Civilization. He will study the relationship between theology and social movements, with special interest in how people’s beliefs shape the kind of social movement they create. His ultimate goal, he told the congregation in his final service, is to become a "public intellectual." During his tenure at UUSC, the congregation grew from 60 to 90 members, with most new members in their 20s and 30s. Noteworthy accomplishments on his watch included strong congregational approval for GLBT (Gay, Lesbian, Bisexual and Transgender) rights, and support for demonstrations in Columbus, at Cleveland City Council meetings and on the CWRU campus. In support of compassionate immigration reform, the congregation stood behind Bossen during his civil disobedience arrest in opposition to Arizona's SB1070 legislation. Members hosted events and sent dozens of letters to the President and to Congress demanding just immigration reform. The congregation also passed a resolution repudiating the Doctrine of Discovery, an obscure 15th-century Catholic theological teaching that forms the basis of much United States property law. Other events included hosting nationally known speakers, such as journalist Amy Goodman and author Ursula Goodenough, and an annual public worship service commemorating U.S. and Iraqi victims of the Second Gulf War. UUSC is a founding organization of Greater Cleveland Congregations, and participates in an ongoing program that works with the local Bhutanese refugee community. Doug Wadkins, Bossen’s temporary replacement, has served as a hospice chaplain and campus minister, and has led congregations in North Carolina, Florida, Texas, Oregon, Wisconsin and Washington. For the past six years, he worked with the Pacific Northwest United Universalist Association District on its Transition Team, helping congregations share the ministry during times of change. For more information about the Unitarian Universalist Society of Cleveland, visit their website at www.uucleveland.org. Walter Nicholes is a member of the United Universalist Society of Cleveland.